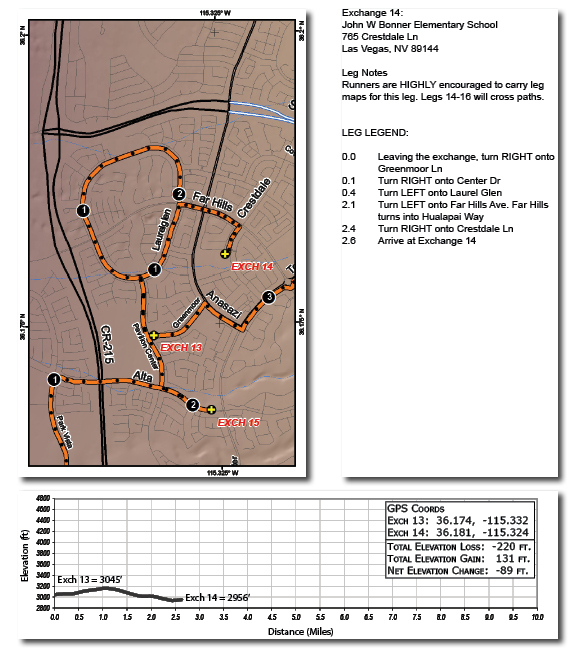 Part 3 of the race recaps of my experience running Ragnar Relay: Las Vegas. 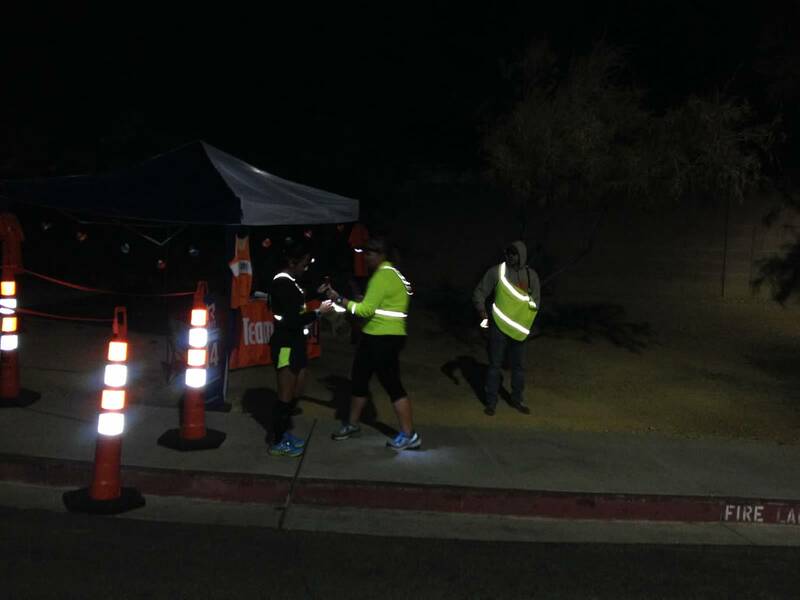 After eating a delicious dinner at Chili’s, we realized we needed to get to the next major exchange relatively fast since our other teammates were speedy and had shorter miles for that round. By this time it was extremely cold. We made it there with plenty of time to spare and chatted with the lovely people of Van 2 and waited for Brennan to run through. Major exchanges are awesome because you get to talk to “the others” and there is usually quite a few more people there to get the spirit going. Brennan came running into the exchange and Nicole took off which meant one thing: I was next. I debated on what to wear but ended up sticking with knee length tights and a long sleeve so-neon-you-can’t-miss-me shirt. I probably should have looked at my leg before hand but all I knew was the mileage (2.6 miles) and that was enough to make me happy. 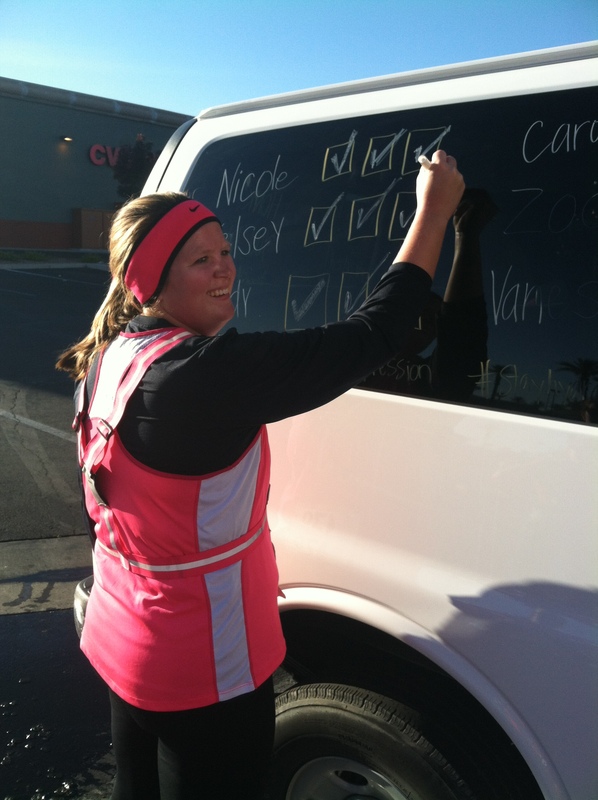 Leg 2 was in a residential area which meant no van support but I couldn’t help but laugh when my van drove by whispering motivational things. 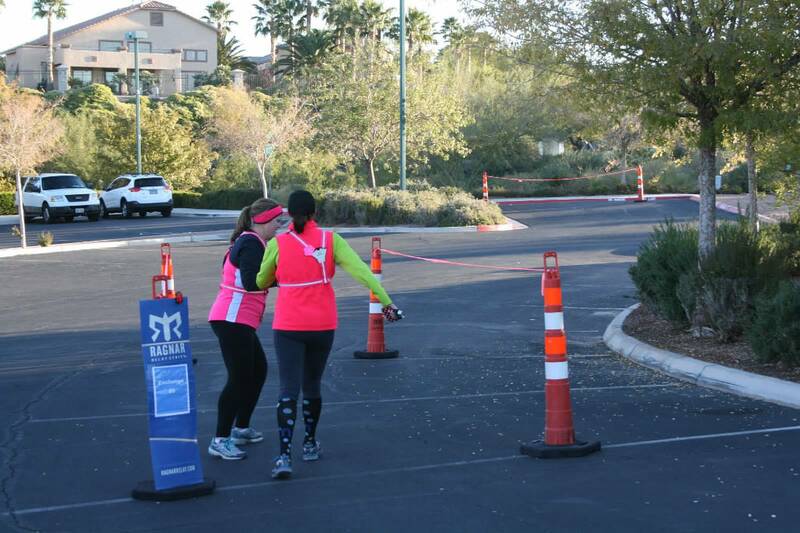 I was nervous going in because Zoe received a text at dinner saying that my leg had been rerouted and to ignore what the race magazine said and to just follow the signs. 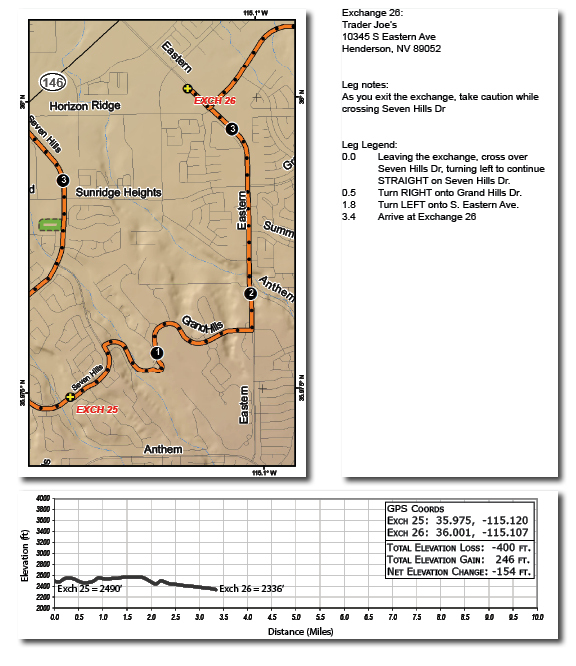 If you read my post about getting lost at Hood to Coast, you will know this made me nervous. Luckily everything was clearly marked except for the fact that this leg was also shared with a later leg so people were coming at me in the opposite direction. It was uphill for the first part which wasn’t terrible and I ran most of it and then walked to catch my breath. By this time the air seemed a lot warmer and I felt silly for being so cold earlier. Unlike most of my teammates, I had no issues with stop signs and stoplights and got to run through every time. Once I hit the downhill portion I ran hard and fast. At least for me. I didn’t look at my watch hardly at all on this leg because I didn’t want to psych myself out. Once I saw the exchange in the distance (up a hill) I really tried to push so I could finish strong and make my team proud. 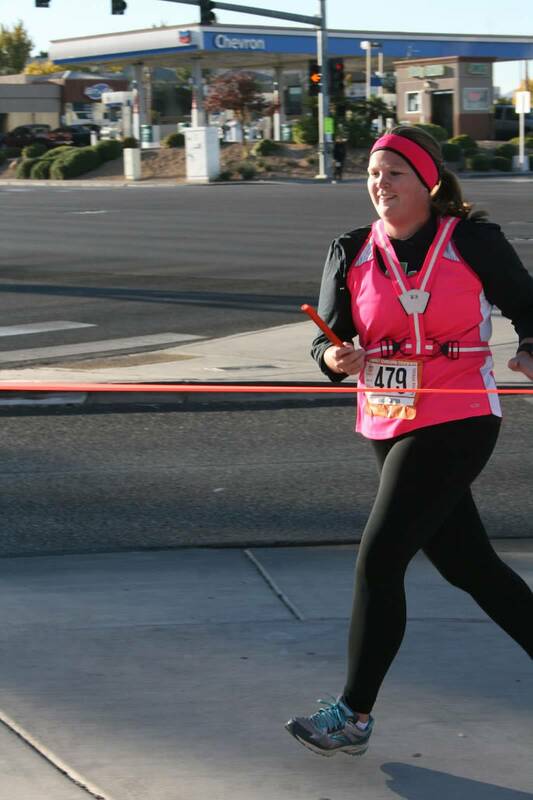 My unspoken goal before running this leg was to finish it in under 30 minutes and I ended up doing it in 30:15. Whatever. 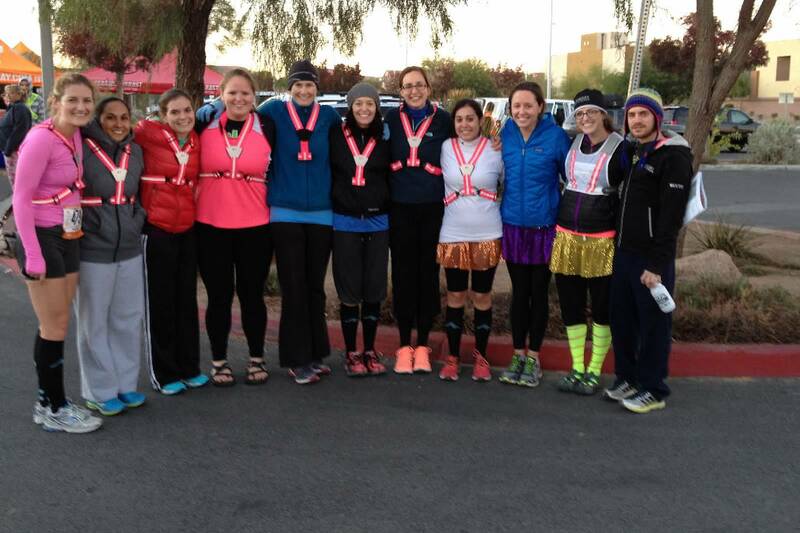 Everyone else ran their legs and it was freezing cold. Tiredness was upon us but everyone still ran very strong legs especially our Vanessa. 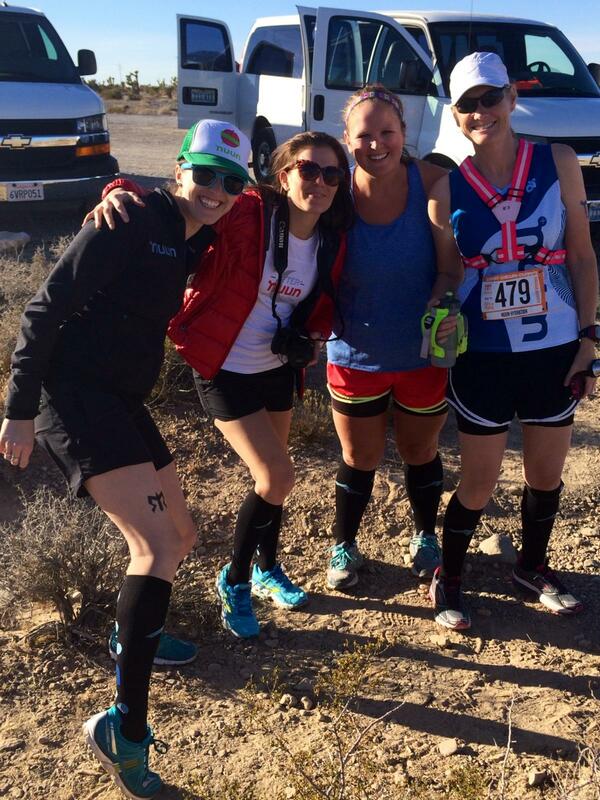 She had to run 10 miles uphill through a canyon with hardly anyone around her and no van support. Not only that but her light to see went out leaving her in total darkness and her cell phone battery was on its last leg. Talk about a trooper. I fell asleep during Vanessa’s leg (sorry) but I believe after she was done we just went to the next major exchange to sleep. 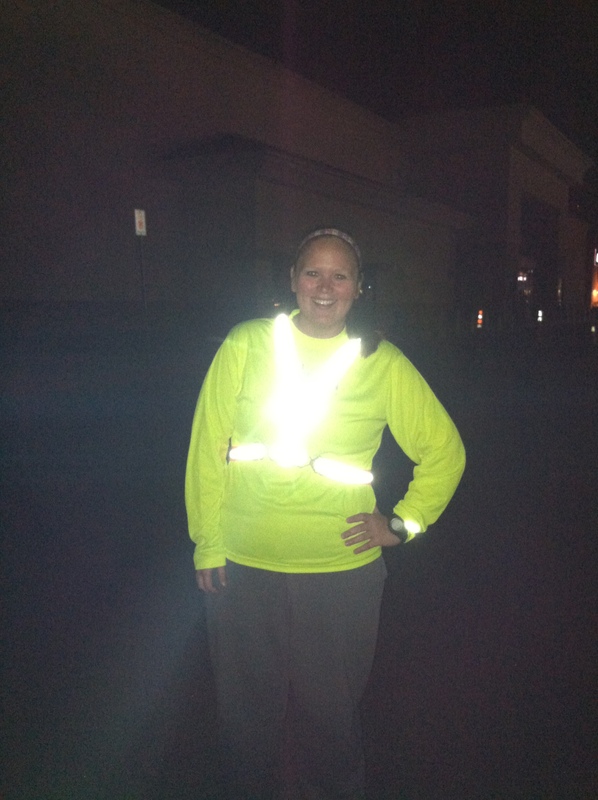 When I woke up it was almost daylight which meant it was time to run again. 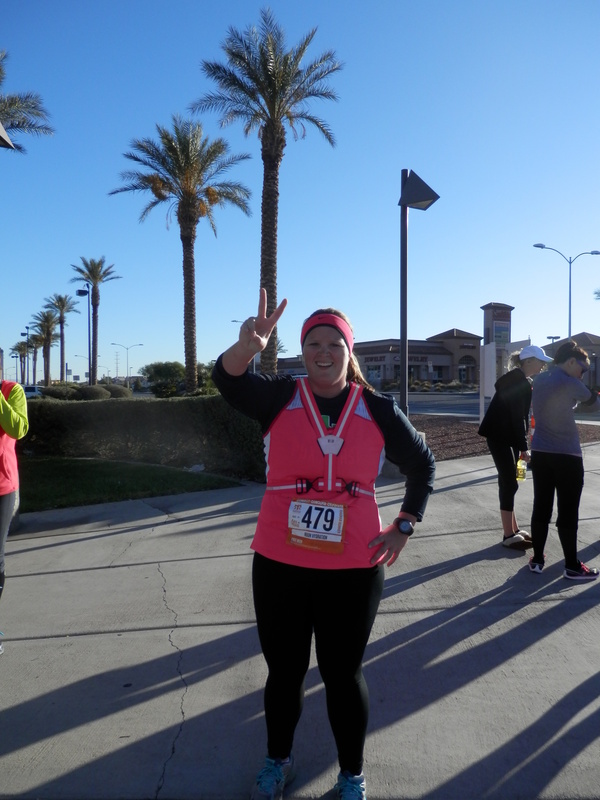 It was still freezing cold but we had to get ready to run. Vanessa was so nice to bring me some hot chocolate and it was divine. Chatting with van 2 made the time go by fast and before we knew it we were off again for our FINAL legs. This is where things got super exciting because we were back in the daylight, slightly out of residential areas, and we were in the homestretch. At the exchange waiting for Nicole to hand off to me there was an awesome dude who set up propane heaters so we warmed our bones next to it. I could not have been happier to see Nicole and her watermelon self coming towards me and I took off and felt good. This leg was uphill some too but it had promises of another downhill and I was going to run hard and I was going to have fun. 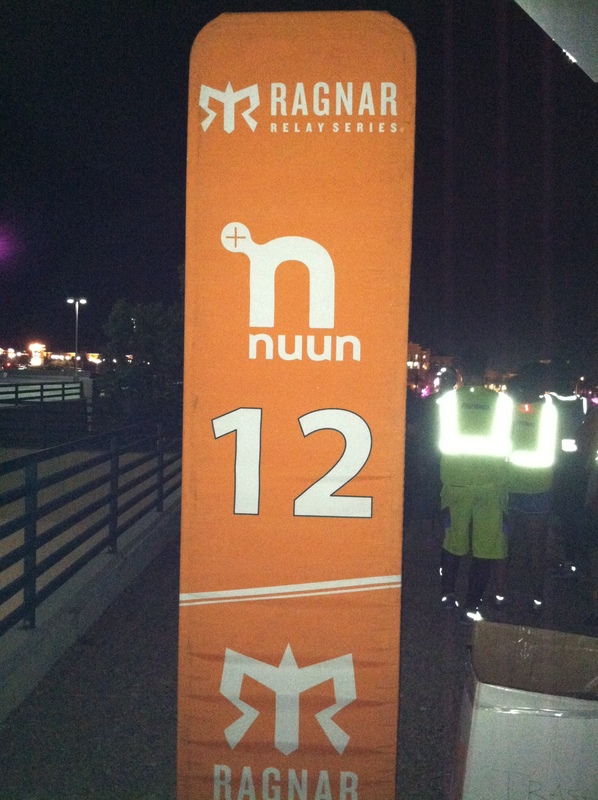 First mile was in 12:06. Thank you tired legs, minimal sleep, and uphill. I was pleased with that. Second mile was 11:23 and final mile was in 10:34 plus 3:59 for my last 4th of a mile. In case you can’t read, that is negative splits. We were in a very busy place with lots of stoplights and gas stations but I saw two people in front of me. I wasn’t sure if they were relay people or not so I made a goal to pass them and pass them I did. 2 kills for this slowpoke and I finished strong. I couldn’t contain my excitement for those two kills. Finally I felt like I contributed something to my team plus I ran negative splits on my final leg. Take that, Ragnar. I apparently came into the exchange sooner than they had planned because Sandy wasn’t even ready for me. 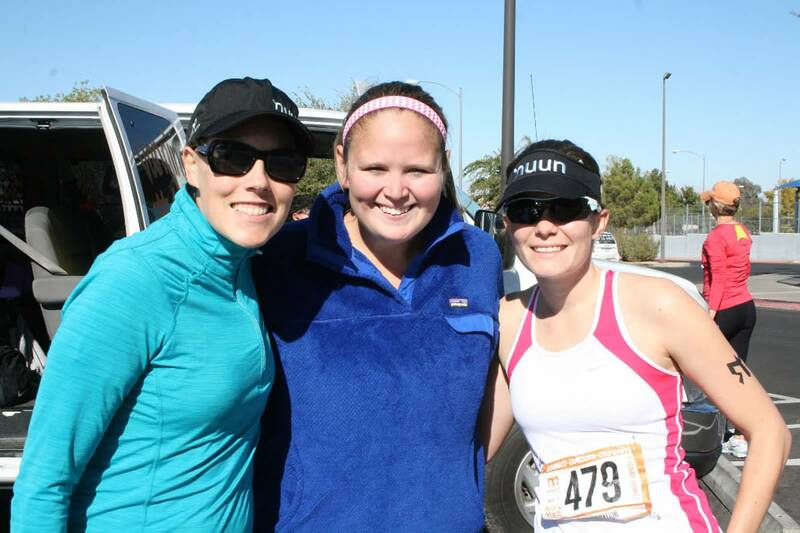 It felt so good to be done with my legs and now all that was left was to cheer on each other. Lots of adventure happened on the last legs like Caroline getting sick after her run, Zoe running a really tough leg but making a new friend, Nicole (and the rest of us) getting lost on the way to the exchange since Zoe was running, and us girls standing on side of the road dancing to a blasting Call Me Maybe as Vanessa ran by. Yes, we had fun. One final meetup with our van 2 people who by the way are total rock stars and we were home free. You could tell the excitement as we finished. 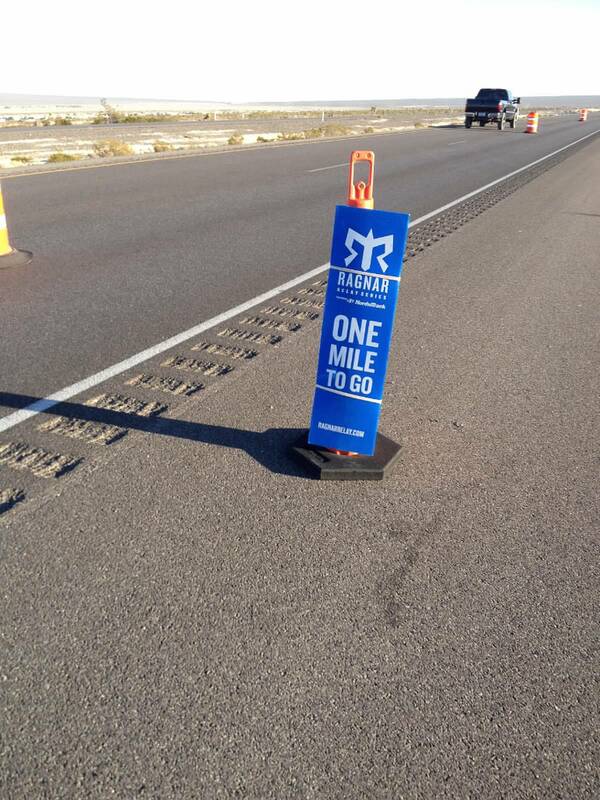 From there it was off to the finish line to wait for van 2 to bring it home. 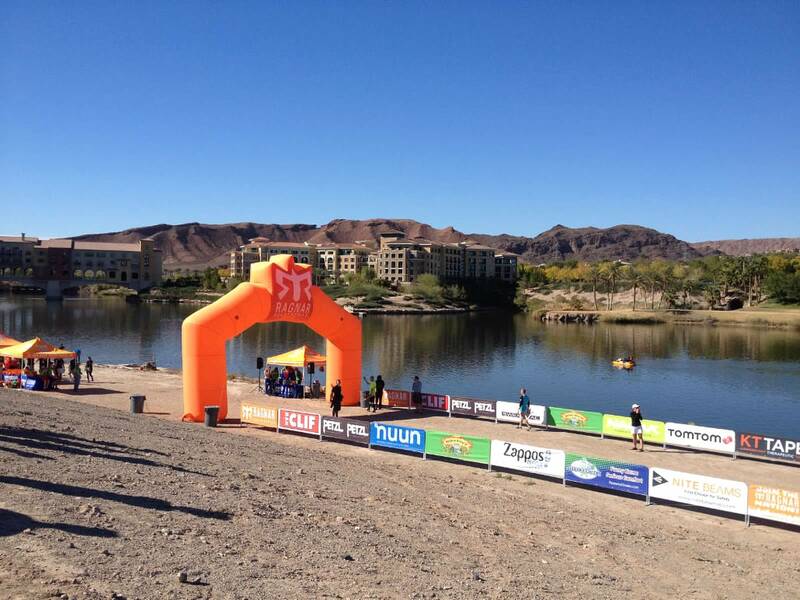 The finish line is in Lake Las Vegas and was gorgeous. We ate a big breakfast at a little Mexican bistro and that in itself was an experience. 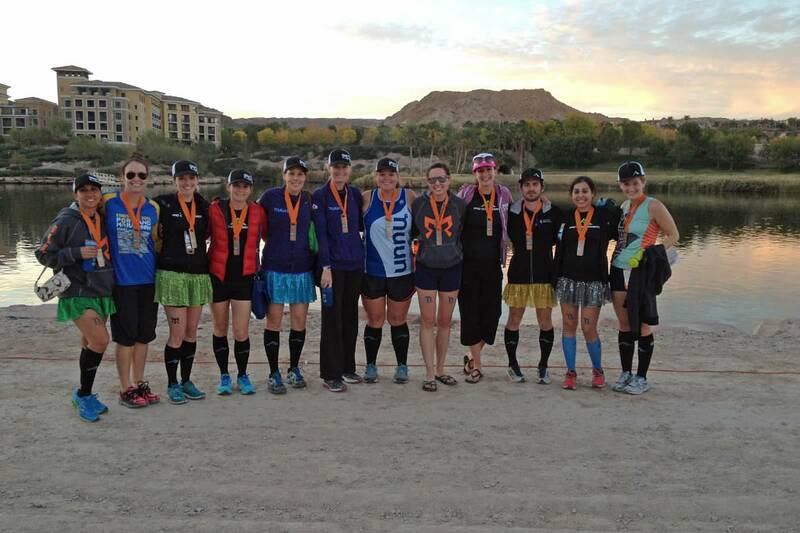 The finish area was really dusty but it was next to a lake and offered fantastic views. 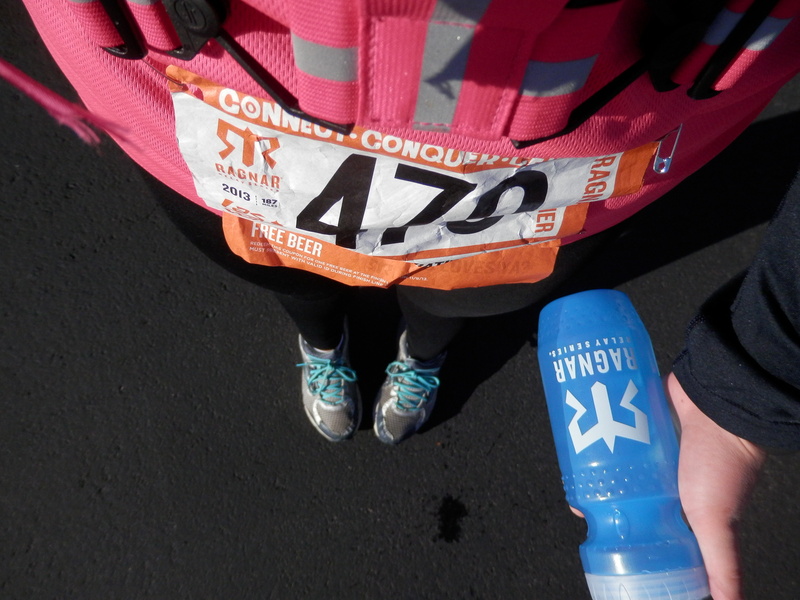 We spent some time at the Nuun and PRO Compression booth showing how we stay hydrated and keep it tight. We ended up going back to the van to just sit and relax for a tiny bit because van 2’s final legs were the toughest of the relay. After going back to the finish line and reuniting we finally saw Brennan and that fast girl didn’t even wait on us she just went on through like it was her job. We all followed behind and got photos made. It was getting dark so we didn’t hang around and socialize too much but we were able to check out the booths more and take in the views. Soon we were on our way to drop Nicole off at the airport which made me so sad and it really set in that our fun adventure was over. We hadn’t even left the terminal and I already missed her. Back at the hotel we all took the most glorious shower that could ever be taken. Caroline decided to get some rest while Vanessa, Sandy, and myself went downstairs to The Luxor Buffet which was unlike anything I have ever seen. 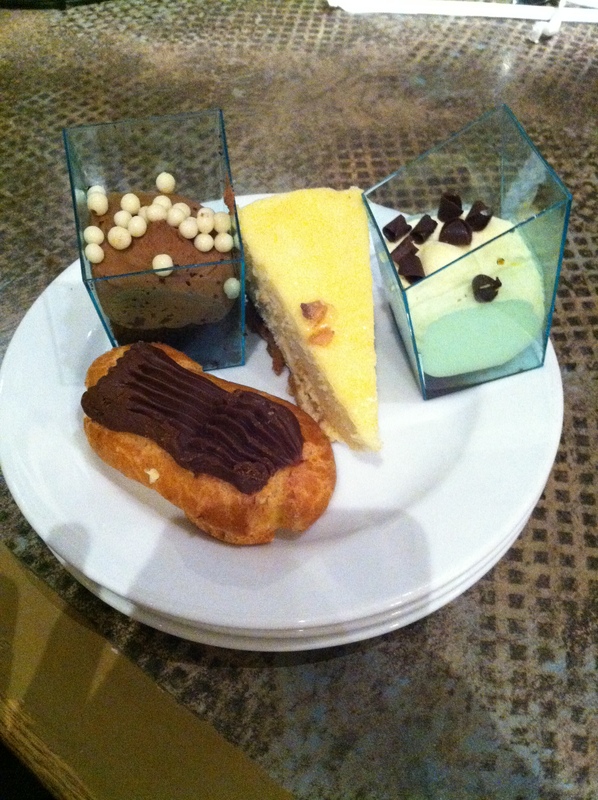 I ate lots of bread and shrimp and loaded up at the dessert area. No shame and no guilt. Thanks to Vanessa for getting us a discount. Dinner was great and we got to all talk even more. Something that was said that really stuck with me was people’s eating habits. Vanessa mentioned she always loves meeting bloggers in real life and see if they eat what they say they eat on their blog. I was relieved when Sandy was so honest and said she will eat whatever she wants to eat no matter if it is pizza or ice cream or whatever and not feel guilty. These women get it. They really do. 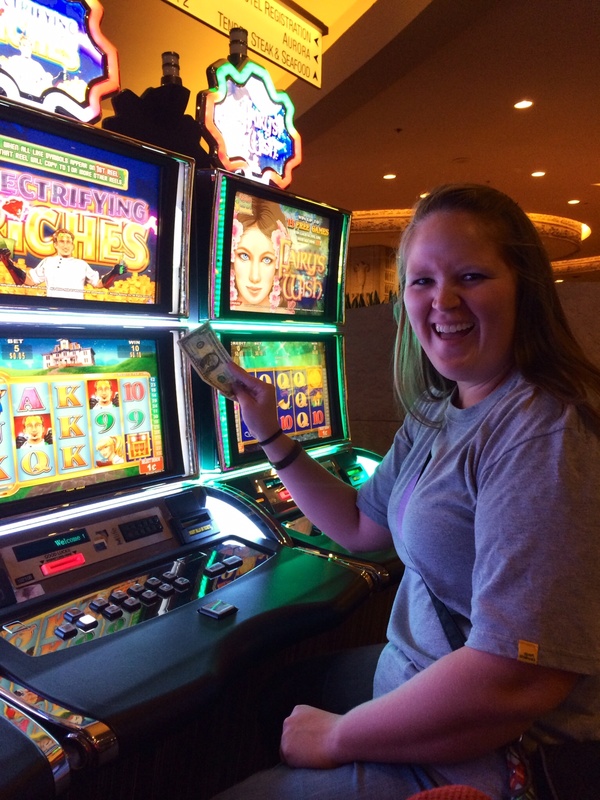 We headed to the casino where the girls and I pressed our luck on some slot machines. I got ahead by a little but cashed out. 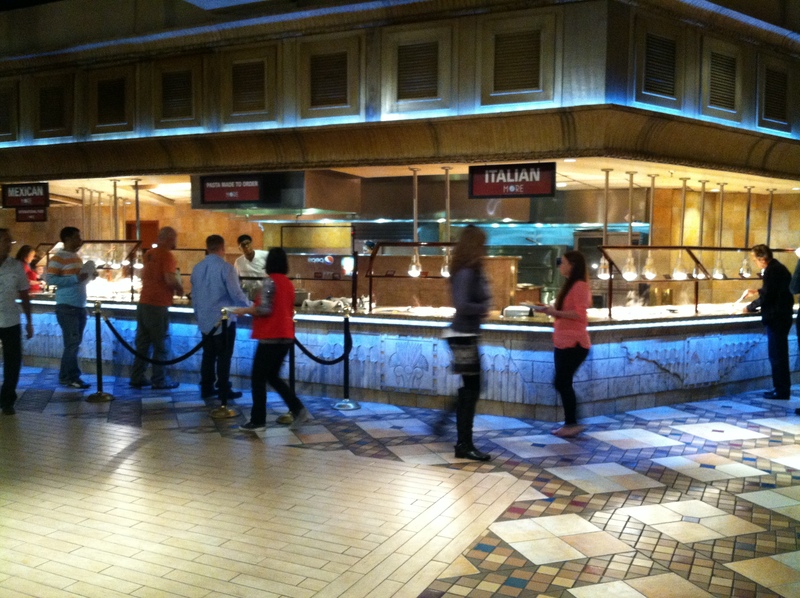 Over the course of the weekend I only spent 15 bucks in the slots and my maximum was 20 so I did good on self-control. Hyla, Ron, Matt, Sara, and Jenny met up with us in the lounge area and we got to talk about our experience and get to know each other more since we had barely seen each other. I wish we could have spent more time together. They realllllly wanted to take me to the Bellagio to see the fountains which was the only thing I cared about doing but it was a long walk and my legs were tired. Plus I had to wake up at 3:30am (sorry, team) for my flight back to good ole Tennessee. I’m so sad Ragnar is over but I’m more than thankful that I met and bonded with so many beautiful and talented women (plus Matt) and that we had a super enjoyable time. The energy in our van was unbeatable and I’m a little skeptical about doing another relay without these ladies. We all contributed something to the team be it our pace, our enthusiasm, our motherly instincts or just kindness. 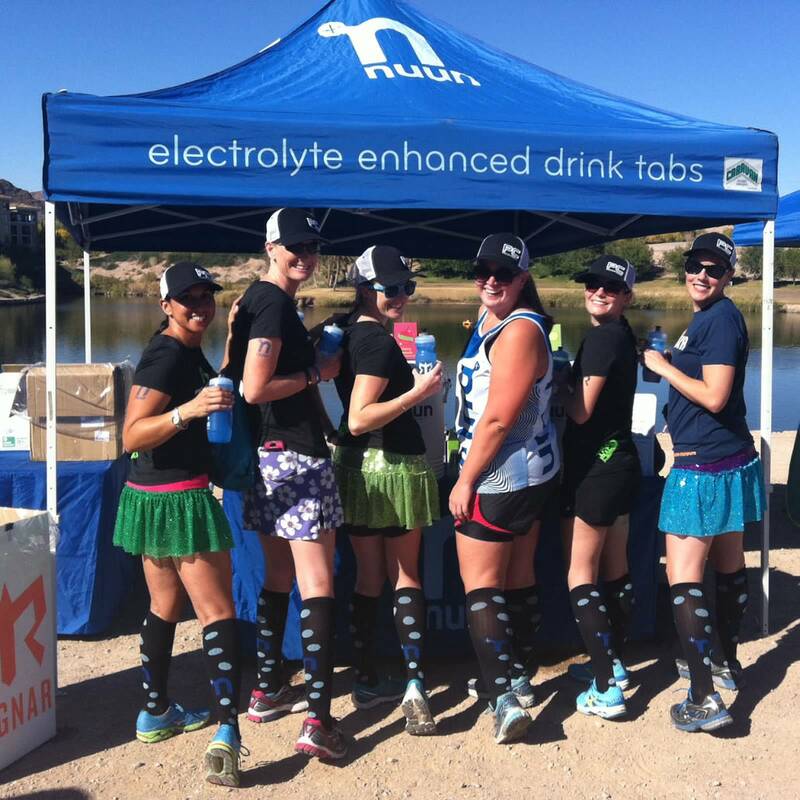 I’m so thankful to Nuun and PRO Compression for sponsoring us and for creating such a memorable experience! 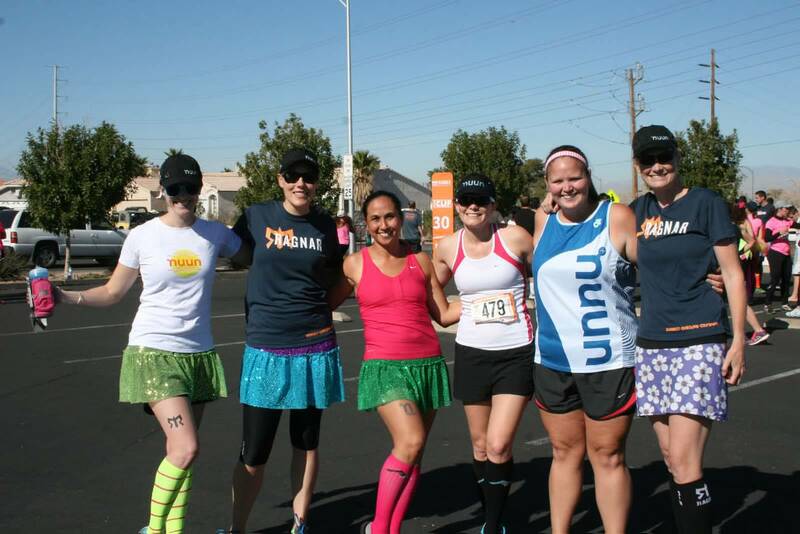 This entry was posted in Race Recaps and tagged race recap, ragnar relay las vegas, ragnar vegas recap by thegogirlblog. Bookmark the permalink. Thanks for the codes, I just purchased my first pair of compression socks. I have the sleeves, but I’ve been wanting a pair of socks, so early Christmas present to myself! Thanks girl! This all looks so fun!!! 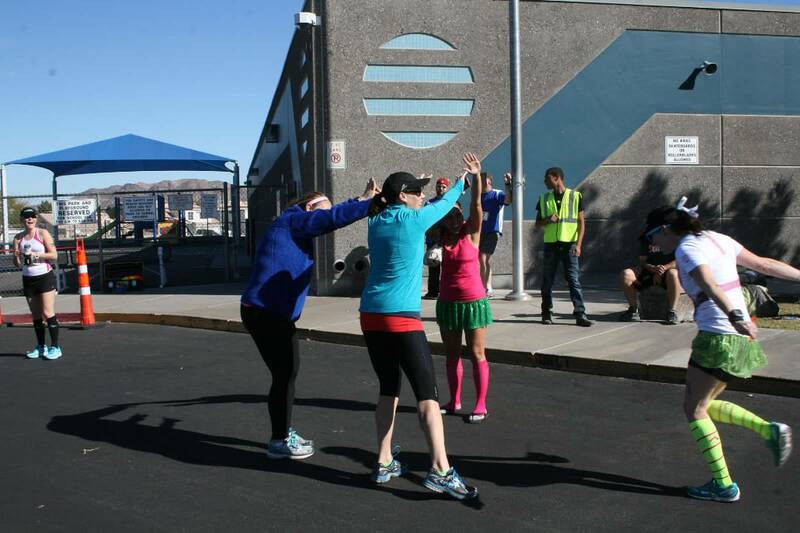 Looks like fun – so much encouragement from the group! Must have been fun to run through the desert, too! looks like you had a great time!! i’m so glad you had relay redemption. and i LOVE those socks!! so proud of you! !